Almost wordless: One of my backyard sunflowers. Leslie, this seems to be unfurling right before my eyes. It’s an amazing photo! Oh my gosh. Leslie, this photo is outstanding! Love how the petals catch the light. I took this in the early morning with my phone. 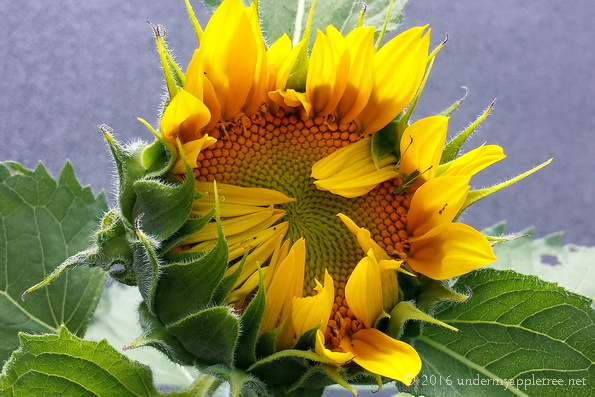 I was filling the bird feeders when I noticed the sunflower facing east, the petals catching the light. It was one of those unplanned shots. How pretty. We didn’t plant any this year. Me either! Mine are all volunteers from the bird feeders. Beautiful sunflower pic! I have been traveling but am back now.